If you’ve tried dog boots or socks on your pet and you find they keep coming off, doggie suspenders can help. The Snuggy Boots Suspender System is made to keep canine footwear in place. This innovative suspender system has five tension straps with clips at the ends. The short one connects to the dog collar while the other four clip to your dog’s boots or socks. When properly adjusted, they stay in place and you can take them on and off by unclipping the collar and sliding the boots off each paw. The boots can stay connected to the straps ready for your next outing. Your dog will never lose another dog boot! When adjusted properly, your dog will also be able to lie down or get up without losing the boots or socks. We have four different sizes of doggie suspenders to accommodate dogs from small to extra large. When you attach the suspenders to their collar and the boots or socks, you’ll adjust the nylon strap to fit the body length of your pet. Once you get the tension right on each elastic leg strap, you can take the suspender system on and off without unclipping the shoes or boots to make it easier. The doggie suspender system can be used inside with socks or outside with the all weather boots. In addition to keeping track of your dog shoes, the doggie suspenders support your pet’s joints. When properly adjusted, the the tension elastic leg straps provide a “lift” to your pet’s joints as they walk. For dogs with arthritis and other mobility issues, they can “lean” into the straps a bit as they walk which helps. If your pet is recovering from an injury that requires a bandage, the Snuggy Boots Suspender System will keep the boots or socks in place over the bandages. Your pet isn’t won’t be able to chew off the bandage. This minimizes the repeated re-bandaging process. 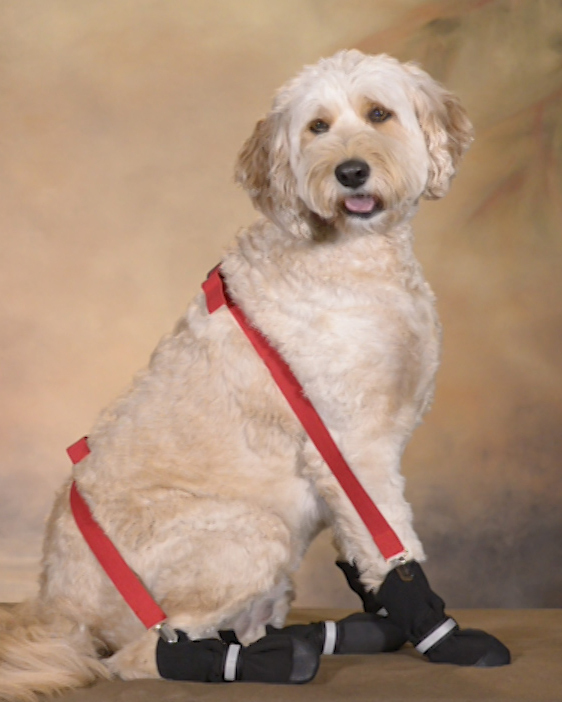 The Snuggy Boots Suspender System will help your dog’s injuries heal quicker. You can learn more about the Snuggy Boots Suspender System here.